Bruce Willis as a mob boss who owns the streets of Detroit? Yeah, that’s okay. After all, he earned it after averting that asteroid from colliding into Billy Bob Thorton, right? It’s only fair we give the man his own city, even if he rules it by drowning underdeveloped Russians. The rest of the time he’s on the hunt for some missing cash that was stolen to save Ryan Phillippe’s father from the general population of prison after Phillippe turned on his best friend 50 Cent who got the money after a diamond heist which now another mob boss wants back but they’ve already ditched the diamonds for the cash… phew. That’s way more complex than it needs to be. Maybe the diamonds are the problem, sort of that ultimate b-movie heist/gangster MacGuffin that cheapens the film before it can even generate some tension. As soon as those shiny minerals hit the hands of our leads, it’s over. It probably doesn’t help that this low budget video flick is towered over by Bruce Willis, 50 Cent and Phillippe over-matched from the outset. Sloppy performances abound, from actors under or overreacting to guns at their head to a sense of grief over having to read some of these lines from this Mike & Mike script (Behrman and Gunther respectively). Set Up comes from the lens of longtime stunt director Mike Gunther (yes, the co-writer too), careless in this element with glaring continuity errors (how does the Gears of War game in the background keep changing levels when no one is playing? ), haphazard editing, and a reliance on jumpy zooms that feels like a trick a freshman director just discovered. It even takes time out to try and make 50 Cent into the good guy as he helps a child in a store reach for a… light bulb? Why was the kid jumping to reach a light bulb? Was it too much to move the camera to the toy department? Crammed into this revenge clunker is a religious subtext that spends about 15-minutes just so 50 Cent can have a punch line in a final stand-off, plus some Bruce Willis ranting about the death of newspapers. Does his mob-ish reach extend to media empires too? If not, why should we care? Actually, even if it does, why should we care? Clearly the thought of tinkering with the visual style was too much fun for Gunther, Set Up astoundingly ugly and rife with consistent errors. The Red One is certainly more capable than this, many of Detroit exteriors clearly standard def material sloppily upscaled with disastrous results. Muddy, pixelated, and overflowing with clear signs of sharpening, there are only a handful of exteriors that work. Those that do are likely stock footage from the plethora of Detroit-based direct-to-video gunk clogging online ques or the remaining rental store shelves. There are two palettes at work, a bitter cold, freezing blue-ish style and a warmth generated from deep oranges. At the least, orange has some control, the contrast well managed and the black levels fair. Getting it out of the way, Set Up does have the benefit of deeply intense blacks, always on par too. That’s a triumph for the Red. On the other hand, the bleaching of those wintery Detroit streets are impossibly harsh and even hard on the eyes. Objects are swallowed by a contrast that doesn’t know when to quit, only enhancing an already rough high-contrast edge transition. All such shots will carry halos, navy/black business suits clashing with brighter walls behind them. What the digital source and color correction won’t butcher is high fidelity detail, pleasantly kept firm in close, and there’s a lot stuff shot up close in Set Up. Facial texture can be impeccable, that outside of a few errant shots where the focus suddenly dips south for no clear reason. What the mid-range will lose to a wonky, slightly filtered look, it will gain with just a little bit of closure between the actor and the camera. If there was any control to this DTS-HD effort, the audio mix could have been something. Set Up opens with a heist just over eight minutes in, assault rifles blaring with an intense crispness and raw power. The fidelity is brilliant, and so is the bass that accompanies it. Unfortunately, it’s coming from all over with no sense of directionality. The stereos light up at the same time and the surrounds respond less they miss something. It’s like being in a pocket of noise. There’s a final gun fight at 1:10:00 where it will mirror much of the same, the power intact without separation. Those looking to be surrounded can have their wish fulfilled here, but that’s about as far as it will go. The mix doesn’t do much else, some dogs barking in the right rear during a drug deal, and apparently, that’s the only dog in the entire neighborhood. It’s always coming from the same direction. Balance favors the action a bit too heartily, although it’s not going to bother many. Dialogue is a cut above many recent video releases in terms of accurate, smooth reproduction, consistently maintaining itself. Director/Co-writer Mike Gunther chats with his stunt coordinator Kyle Woods via a commentary track, that followed in the menu by Making Set Up. It’s a basic, static-y sounding nine-minute look at the shoot. 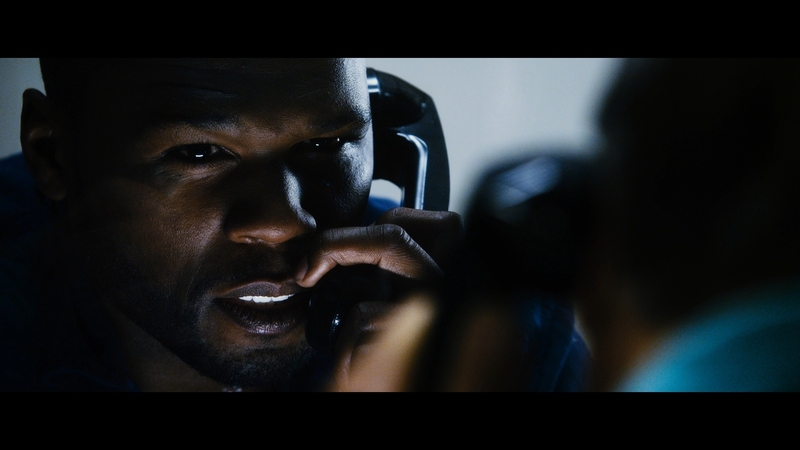 Inside the Gun Locker is a visually abysmal piece on the weapons used throughout the movie, followed by a series of three interviews (Gunther, 50 Cent, Randy Coture). Lionsgate shoves in some trailers after that.